The goal of CFSES is a scientific understanding of subsurface physical, chemical and biological processes from the very small scale to the very large scale in order to predict the behavior of CO2 and other by products of energy production that may need to be stored in the subsurface. CFSES is funded by DOE Basic Energy Sciences and is a cooperative of the The University of Texas' Petroleum Engineering, Jackson School of Geosciences, the Gulf Coast Carbon Center, and Sandia National Lab. The entire grant is $15.5 million award and GCCC staff have been involved in several tasks. Click diagram to view larger. For Task I, Katherine Romanak worked with scientists from Sandia National Lab and UT's Department of Geological Sciences. An apparatus for separating fluids collected from the supercritical reactor has been built and tested (see figure at right). 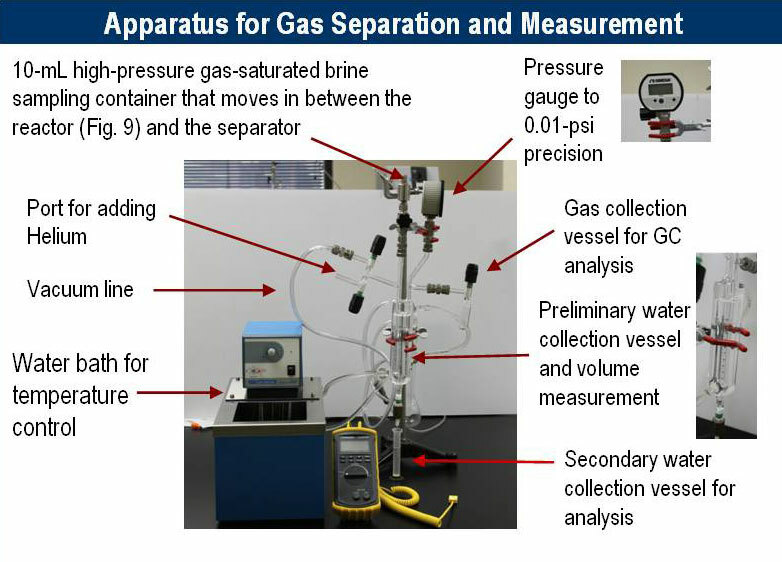 The apparatus separates dissolved gases from brines at ambient pressure and temperature for dissolved gas solubility measurements. Lab experiments on the high PT apparatus were coupled with pore scale modeling, molecular modeling, microbial studies, and imaging the behavior of supercritical CO2. For Task IV, Susan Hovorka and Ian Duncan, along with GCCC staff provided case studies, which were used to develop code optimized for multiscale, multiphysics processes. SECARB Stacked Storage at Cranfield is one of the few locations where dense data have been acquired to support this code development. Data compilation and clean up were performed to create a model input file, including the time lapse data needed to constrain the model in terms of lateral extent and variability in saturation. In October 2014, UT Austin received a $12 million grant from the U.S. Department of Energy for carbon storage research aimed at reducing greenhouse gas emissions. The four-year grant is an extension of a CCS research project at the university's Center for Frontiers of Subsurface Energy Security (CFSES) led by Larry Lake at the Center for Petroleum and Geosystems Engineering (CPGE). The CFSES project draws together twenty faculty and researchers from across UT, including a number of GCCC researchers who are playing key roles. Hilary Olson is Assistant Director of CFSES. Tip Meckel is the UT Lead for the theme, Buoyancy-Driven Multiphase Flow. Susan Hovorka and Tip Meckel will both work on mesoscale modeling and invasion-percolation modeling. Changbing Yang will work on geochemistry at the fluid-fluid interface. CFSES also involves active collaboration with researchers at Sandia National Laboratories. The CFSES research program is designed to address challenges critical to developing the CCS technology at a scale required to mitigate emission of greenhouse gases. These challenges include sustaining large carbon dioxide storage rates, on the order of gigatons a year, for decades, without compromising subsurface resources or storage security; using storage volumes with unprecedented efficiency, increasing from current estimates of 5 to 50%; and controlling undesired or unexpected emergent behavior in the geostorage system. For more on CFSES activities, please see the Center's home page.